Sights from a recent East River excursion, in today’s post. One does not get to view Mighty Triborough from the water that often, although the Astoria Park perspective on Robert Moses’ great bridge is familiar and loved, so while onboard a boat carrying the Metropolitan Waterfront Alliance’s annual conference, one ensured that a few shots were captured of its majesty. Moses was a gigantic jerk and a bit of a tyrant, of course, but on more than one occasion I have remarked on the particular esthetic charms his teams incorporated into their projects. The bath houses at Riis Park, and Jones Beach, the bridge pictured above – modern day planners are driven by economy and “design standards” which strip their civil works of the sort of visual panache that the depression era build outs offered. Far better than the brutalist crap of the 1960’s and 70’s which were inflicted on the public, of course, but modernity is not even close to being in the same artistic league with the earlier stuff. 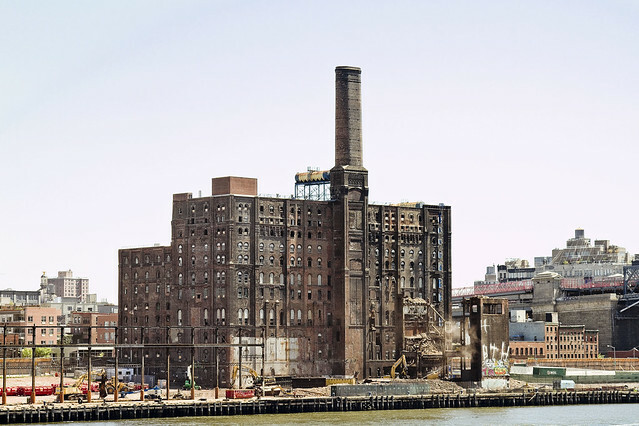 Speaking of earlier stuff, the annihilation of the Domino Sugar site in Williansburg continues. Recently, Our Lady of the Pentacle and myself were obliged to make an appearance at a 20 something year old’s birthday bacchanal at a bar in the former “Bushwick Strand,” and coversation with a member of the “Millennial” generation ended up being revelatory. This particular kid realized fully that the lifestyle and “scene” in Williamsburg was not just threatened but doomed by the large scale construction underway in the area, and she was wondering what life would be like in my beloved Astoria. One intoned that Astoria would make a great home for an older iteration of herself, when “going out” would indicate that you were going to have dinner at a restaurant rather than spending the night at a fashionable bar. Her section of North Brooklyn is for the young and unsettled transients struggling to define themselves, whereas Astoria is for families and is still very much a community of long term neighbors. Speaking of communities, the staggering growth of Hunters Point over the last five years is best realized from the East River. 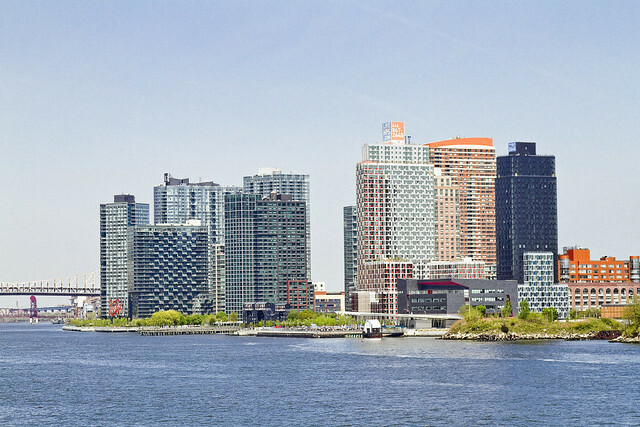 A humble narrator has been shooting the growing skyline here from the water for several years now, but with the Hunters Point South development finally becoming a reality, the “Modern Corridor” of Long Island City is beginning to reach critical mass. Any doubt as to why I refer to the East River frontage of LIC as “Tower Town” should be eradicated by the shot above. 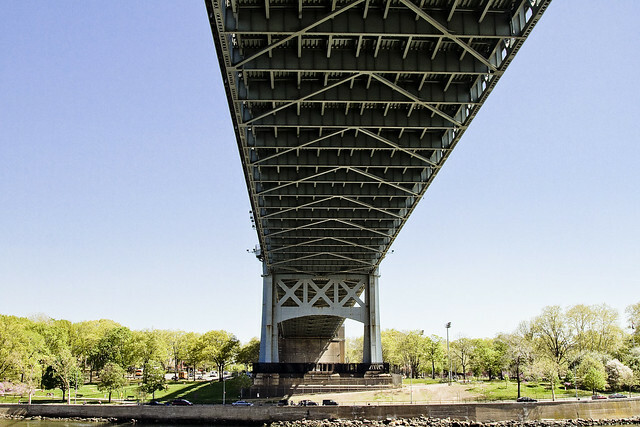 The Astoria Park seen here under the Triborough bridge looks bucolic but the bridge’s traffic makes an ongoing racket for the park-goers. Tower Town: all those residents (and more to come) trying to get onto the subway at Vernon-Jackson? Still human architecture in your neighborhood and you usually can get a seat on the R train. Maybe Robert Moses was after all really an artist where concrete and steel were his medium and New York was his canvass. Relentlessly pursuing his visions or “getting things done” as he called it where being a power broker was simply a means to his own ends. It was his obsession with creating his masterpiece, Flushing Meadows Park, that ultimately brought about his downfall.